Arnold Cooke was born in Gomersal in the West Riding of Yorkshire on 4 November 1906. He gained his B.Mus. from Cambridge in 1929. After this, he departed to Berlin where he was a student of Paul Hindemith at the Hochschule für Musik. On returning to England in 1932 he held a number of appointments including director of Cambridge Festival Theatre, and a Professorship of Composition at the Manchester College of Music - now the Royal Northern College of Music. During the Second World War he served in the Royal Navy. After demob, Cooke was professor of harmony, counterpoint and composition at Trinity College of Music, London. He remained in this post until his retirement in 1978. Cooke eschewed various modernist techniques such as serialism, and was never attracted to the avant-garde. He wrote that his music is ‘mainly based on traditional procedures and principles … I do not have any particular theories of composition, just a natural inclination for it.’ His music is eclectic, approachable and firmly rooted in traditional tonality spiced with dissonance and a modicum of ‘Bartókian ruggedness’. Although there is little in the way of British nationalism in his style, there is a certain ‘English lyricism’ that adds warmth to his music. He has composed a wide range of music including an opera, Mary Barton, a ballet, Jabez and the Devil, six symphonies, a number of concertos, choral works, songs and chamber music. Arnold Cooke died on 13 August 2005 at his home in Five Oak Green in Kent: he lived to the grand old age of 98 years. Brian Wilson in his review of this CD on MusicWeb International points out to the listener that they may not ‘fear that (Cooke’s) symphonies composed in the 1970s will be filled with all sorts of avant-garde features then in vogue …’ In fact, criticism is liable to come from the other direction that Cooke was outdated, unchallenging and a martyr to Elisabeth Lutyens swinging criticism of the ‘Wenceslas Generation’, who followed in their masters’ footsteps. In fact I am not sure that any symphony by Cooke was premiered at Cheltenham. The violin and the clarinet concertos along with the Piano Sonata No.2 were first heard here. As an aside, Lutyens also called RVW’s followers ‘corn merchants’ not to be confused with Walton’s dubbing of Humphrey Searle and Lutyens herself as the ‘twelve tone Reds’. 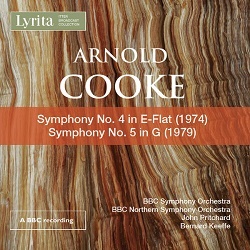 Cooke’s Symphony No.4 was a Philharmonic Society Commission completed in 1974. The first performance was at the Royal Festival Hall on 15 January 1975. John Pritchard conducted the BBC Symphony Orchestra. Meirion Bowen, reviewing the Symphony in The Guardian (16 January 1975) suggested that if a future edition of Radio 3’s once popular programme The Innocent Ear were to play this work, listeners would be baffled. Was it a forgotten essay by Paul Hindemith or a discovery from the pen of Anton Bruckner? Four years later, Arnold Cooke finished his Symphony No.5 in G major. It was first heard on a BBC broadcast on 17 July 1981 as part of the Midday Concert. The Symphony had been recorded on 28 January by the BBC Symphony Orchestra and was conducted by Bernard Keefe at the New Broadcasting House in Manchester. I was particularly impressed by the woodwind writing in the slow movement featuring oboe and clarinet. It is a lovely moment that the listener wants to last for ever. I enjoyed some of the urbane and thoughtful writing in the trio section of the scherzo. Two things struck me about these symphonies. Firstly, they are both written in traditional four-movement form with the slow movement in second position. Bowen noted that Symphony No.4 was ‘crystal clear to follow, perfectly proportioned in the best academic traditions.’ I do hope that he is not using the word ‘academic’ here pejoratively. The same comment could apply to Symphony No.5. Undoubtedly, at this time in musical history any symphony written in this style would have stood out from the crowd – it was an era or experimentation, breakdown of tradition and musical offence, often for the sake of causing offence. This is not the whole story, as a glance at Eric Gilder’s listings for the latter half of the 1970s will show: there was still much ‘tonal’ music on the horizon. However, ‘progressive’ music was usually seen as the future, whether listeners appreciated/enjoyed it or not. Arnold Cooke’s Symphonies must have appeared reactionary or naive to the 'avant-garde'. Secondly, I would suggest that whoever Cooke’s models were — and this may include Havergal Brian — he has synthesised them into his own voice. Whatever the continental influences, Cooke is a British composer and this is evident in the mood and style of many passages, especially in the slow movements. This applies to much of his other music as well. I enjoyed both these symphonies. It is a great luxury that listeners in 2016 can look back 40 years and be untroubled by ‘isms’. We do not worry about what our musical ‘superiors’ tell us is important and vital and to what we ‘ought’ to listen. There is much of interest in these two works: I was impressed and often moved by what I heard here. The production of this CD is outstanding: after more than 45 years of listening to their records, I expect no less from Lyrita. The re-mastering of these two radio broadcasts seems to me to be near-perfect. Paul Conway gives a detailed analysis of both symphonies which deserve study before listening. Eric Wetherell, in his short monograph on the composer (BMS No.3, 1996) suggested that ‘chief amongst Cooke’s orchestral works are his six symphonies.’ He adds that they are rarely heard. I have done a few searches on the ‘net and find little evidence of any further performances of these two distinguished pieces in the concert hall. I understand that the Symphony No.6, which was completed in 1986 has yet to be performed. I look forward to being contradicted on both these points. We are lucky in having four of Cooke’s six symphonies (Nos. 1, 3, 4, 5). One can only hope that some day soon the entire cycle will be complete. Based on what I have heard, Cooke is an important ‘symphonist’ that deserves his place in the symphonic repertoire.